Digital Labor. Artificial intelligence. Robotic process automation. Lately there is a lot to talk about the potentials for digital labor, and the benefits of automation in all companies. While moon shots like cognitive computing / platforms require heavier investments of time and capital, there are easier and faster ways to generate digital labor benefits. Specifically, a strong first step is through the use of robotic process automation. To help clarify the how and where, we wanted to create a multi-part blog to bring more awareness to the topic and cut through a lot of the noise that is out there. This first post is defining what is RPA since there are a lot of items that sometimes fall into the overall bucket of RPA. Our next installment will be why RPA is important and why it matters to you. Finally, we will provide steps to focus on for a successful implementation. The Institute for RPA and AI defines Robotic process automation (RPA) as “the application of technology that allows employees in a company to configure computer software or a “robot” to capture and interpret existing applications for processing a transaction, manipulating data, triggering responses and communicating with other digital systems.” So what does that mean? Simply put, RPA is the automation of a process (or processes) that will remove or reduce the human intervention in that process. This can be as simple as removing the redundancy of re-entering data in multiple systems or removing the frequently updated items based on simple logic. Overall, the benefit of RPA is to reduce the manual intervention in repetitive, routine tasks within a process flow and automate it so it is accurate and predictable going forward but also to free up the human intervention for more significant tasks like analyzing and interpreting the data. RPA seems to be the next iteration of how organizations have focused on technology improvement. In the late 80s and though out the 90s and 2000s, organizations implemented enterprise software. The original goals for implementing enterprise software were to A) improve processes with the “built in” best practices and B) have consistent, accurate data that was integrated with other parts of the organization. For instance, vendor setup was shared with the purchasing application and accounts payable application – thus limiting the redundant data management in both applications. This was the argument for Enterprise ERP or HCM solutions. Cloud computing makes a difference with RPA. For the last couple years, organizations have been moving their enterprise software to the cloud. This provides the value of having someone else support the software as organizations realized how cumbersome and costly supporting large enterprise applications can become. RPA becomes the next iteration of the organization’s focus where an entire process flow becomes seamlessly integrated and can require little or no manual intervention. My good friend Paula shares an example on this transformation in the telecommunications industry. Many years ago, if you wanted to call someone you would call the operator and explain to that person who you wanted to call. They would manually connect your line to the destination’s line (sometimes requiring many operators to get involved if the call was of a significant distance). You could not call someone without the manual intervention of the operator. Eventually, the telephone systems were all automated and now you simply dial the number you want and it is connected with no manual intervention. This is significantly more efficient and cost effective as the use of the telephone exponentially grew. This is the same as RPA, but on organizational processes, in real time. RPA can include “bots”, which are small pieces of a process that are now automated. An example would be where an organization that automated the process of answering questions for their staff on how much vacation time they had left or questions about their insurance information. This “bot” (short for robot) would know the identity of the person asking the question based on their active directory authentication when they logged into the network. The employee could ask this Human Resources Bot what amount of vacation they had left and it would go and query the HR database for the balance and display their current balance as well as when the last time they took vacation. It could also answer simple questions like the contact information for their benefits insurance provider or what benefit plans they were signed up for. All of this minimized the impact of the internal HR team to answer routine questions and allow the staff to work on more important tasks – yet still answering the questions that the employees needed answered. We will address the items on the “A.I. Spectrum” in future blogs where intelligent automation services blurs the lines between RPA and A.I. 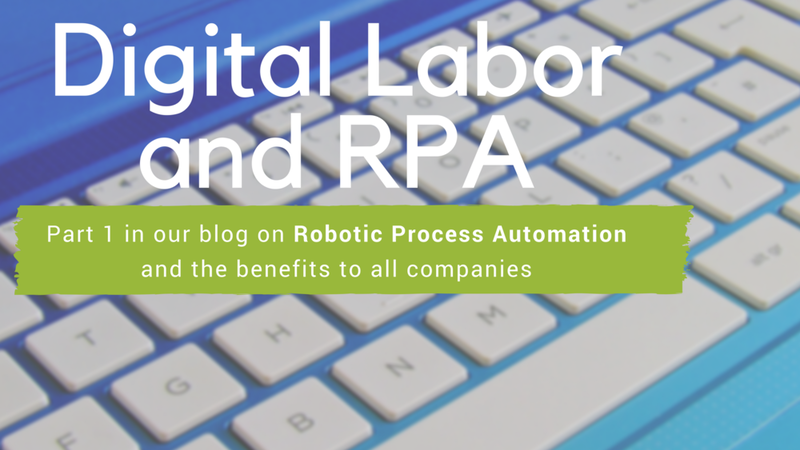 In the next blog we will address in more detail RPA and why this is important to you and your organization.